This is the age of the smartphone — at last count some 33 million iPhones and millions of Androids have been sold — and a new avenue for marketing your company has been paved. Branded smartphone applications (or Apps, as they have come to be called) give your company a new opportunity to put your name and services in the palm of your customer’s hand. Talk about a captured audience — the smartphone App lets you interact with your tech-savvy, mobile audience on a one-to-one basis. How can you leverage this opportunity? If your company’s website offers valuable, sought after content, then you have the power and the tools to engage current clients and reach out to new, potential customers. However, before leaping into the pool, consider what your company has to offer and how it can attract this audience. There are a variety of methods to engage your clients with mobile Apps. Understanding your company brand and your client profile will determine which type of App will suit your customer’s needs. Information or content-based Apps can work great if your company possesses a dictionary of common used industry terms or streams industry news like Financial News Radio. Entertainment Apps can be games or fun little gadgets that can keep your audience amused and busy while waiting at the Doctor’s office, such as NYTimes Crosswords. The Utility App generally works the best for businesses. 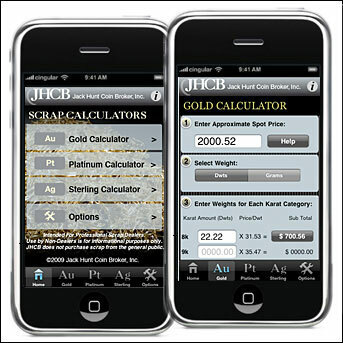 Like the new Jack Hunt Coin Broker’s Scrap Calculator, if your company can offer a handy tool that would be useful for your client in a hand-held environment, then you have a chance to expose your expertise, knowledge and company’s brand to potentially millions of smartphone users. If it is truly a useful tool, with the likelihood for repeated use, it offers customer’s the opportunity to view your logo every time they use your App, building brand equity. By repeatedly presenting your name and logo to your clients, you can keep your company fresh in their minds so the next time they need the goods or services your company provides, chances are, they will think of you. As with any new marketing venture, you will need to present it to your audience. Of the millions of Apps available for download from the iTunes store, many are never downloaded or used. Once you have built your branded App, you will have to push it to your audience by advertising it on your website and printed collateral, getting your current clients to download it and making sure they use it. If possible, make it free to encourage it’s chances of being downloaded. As technology continues to evolve at a rapid pace, it is important for your business to stay ahead, using every available opportunity to promote your company and keep yourself in front of potential clients and on the minds of your current customer base. With new technological advancements, new opportunities arise to build on brand loyalty. Use these opportunities to keep your company ahead of your competitors.